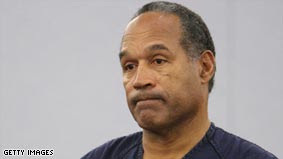 Today, a Las Vegas judge sentenced the “Juice” O.J. Simpson to 15 years in prison for being the leader of an armed robbery at a Las Vegas casino involving sports memorabilia and personal family items. Simpson could become eligible for parole in nine years. He was led from the courtroom in shackles. Judge Jackie Glass told Simpson he was arrogant and ignorant. She stressed that his sentencing was not payback for his acquittal 13 years ago in the murder of his former wife, Nicole Brown Simpson and friend Ron Goldman. The Brown family expressed sadness over how Simpson’s imprisonment will leave his children Justin and Sydney Simpson of yet another parent absent in their lives. Fred Goldman, the father of Ron Goldman, told reporters after the hearing; “This monster is where he belongs—behind bars”.